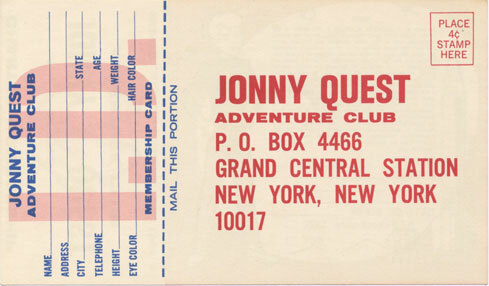 The Jonny Quest Adventure Club promotion was a red-carpet, all-expenses-paid adventure tour from their home across the United States and back! 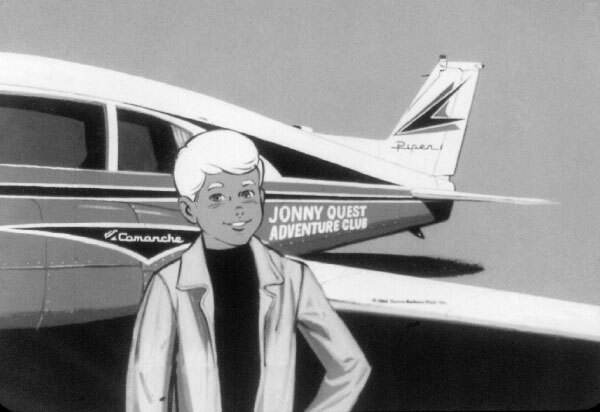 The club was sponsored by Hanna-Barbera, Screen Gems and Piper Aircraft Corp. 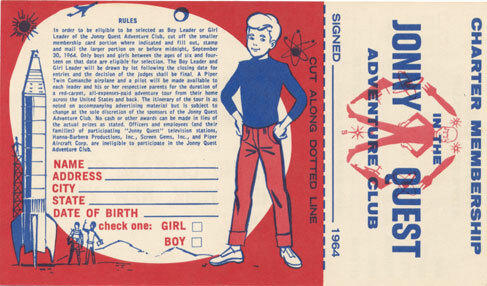 The card and instructions measure approximately 6-1/2 by 3-3/4 inches. 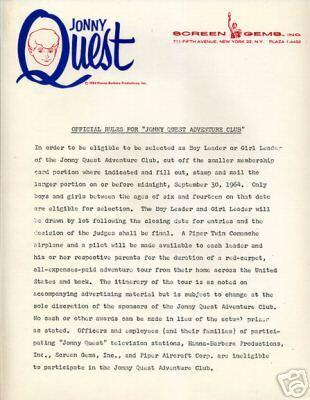 According to the rules, boys and girls who would be between the ages of 6 and 14 on Sept. 30, 1964, could enter the contest by sending in the post card. A "Boy Leader" and "Girl Leader" will be chosen in the drawing. "A Piper Twin Comanche airplane and a pilot will be made available to each leader and his or her respective parents for the duration of a red-carpet, all-expenses-paid adventure tour across the United States and back." The press release is a repeat of the rules and doesn't contain the itinerary of the trip. At least three different black-and-white slides were produced to help promote the contest. At this point, all we know is that the slides exist, not that they were actually distributed. 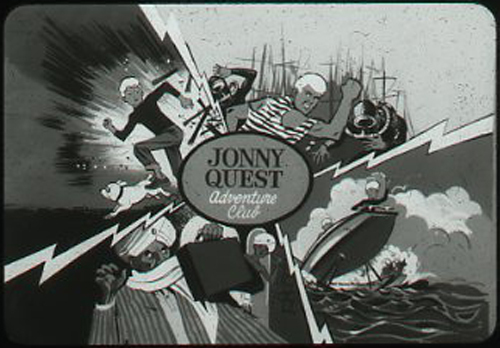 This first slide is a montage of promotional images that illustrate the adventure quality of the show. Unfortunately, Craig wasn't the high-bidder on eBay for this one, so all we have is a low-rez pic. Race's striped shirt is from pre-production drawings. 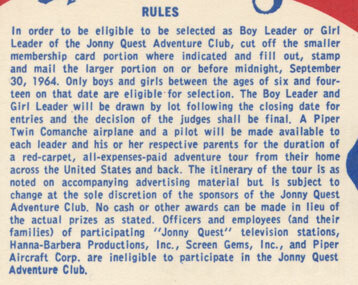 The second slide shows Jonny in front of a Piper Comanche airplane, like the ones that the contest winners would use on their cross-country tour. 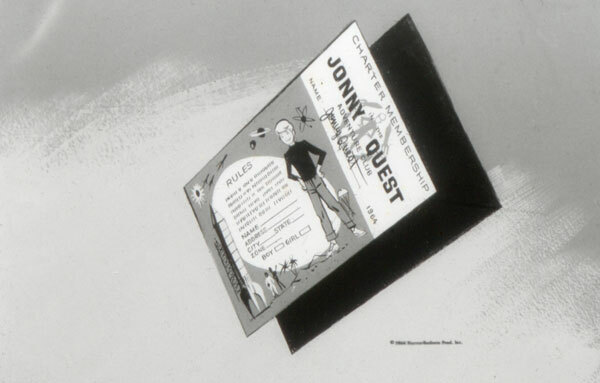 Jonny's blond eyebrows are sometimes seen in pre-production drawings. The third slide is a drawing of the contest entry form / membership card.